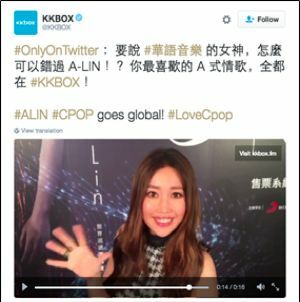 SINGAPORE, May 27, 2016 - (ACN Newswire) - Chinese pop meets Twitter, the live communications platform to the world - Chinese Pop goes Global through @KKBOX on Twitter. 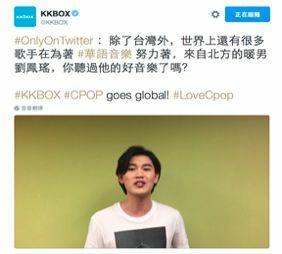 Twitter and KKBOX, Asia's leading music streaming brand, are working to expand the appreciation of Chinese pop music, or Cpop (#Cpop), to a global audience. 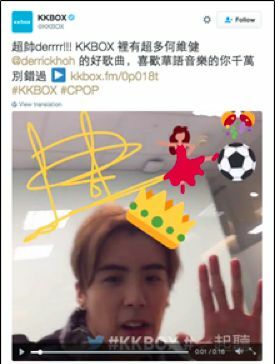 KKBOX is creating #OnlyOnTwitter Cpop content on their official Twitter account (@KKBOX), including weekly live Twitter Q&A interviews with Cpop artists, autographed video clips from Cpop musicians and producers using Twitter's Challenger app, regular #KKvote contests to engage overseas Cpop fans, and live broadcasting of Cpop concerts and the annual KKBOX music awards via Periscope (@KKBOXTW) to the world. An increasing number of Cpop artists such as Jam Hsiao (@JamHsiao0330), Z-Chen (@zchen0508), May Day (@Mayday_EN), IO Band (@ioband), Tia Ray (@tiaraymusic), Vanness Wu (@VanNessVanWu), Stefanie Sun (@Stefsunyanzi), Kelly Lin (@kellyhlin), JJ Lin (@JJ_Lin), GEM (@GEMoving), Shung Xiao Yu (@ShungXiaoyu), Coco Lee (@cocolee117), and Erika Liu (@ErikaLiu0314) are already on Twitter to amplify their music to the world. 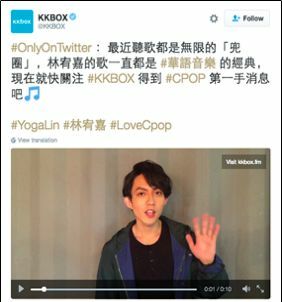 With the #LoveCpop campaign from now, Cpop artists are showing support to KKBOX to bring Chinese-language music to the world. Catherine Chien, Marketing VP of KKBOX, said: "KKBOX offers the most comprehensive Asia-pop music library. This year, KKBOX's tracks have grown from 20 million to 25 million. Also, over 2,500 artists and celebrities are longtime supporters of KKBOX. With Twitter as our social media partner, we will co-create exclusive content on Twitter for Cpop fans and artists to share their music appreciation with the world through the live communications platform." Margot Ling, Head of Media Partnerships of Twitter Greater China, said: "We want to bring more Chinese-language content to Twitter to make our global communications platform the live connection to Chinese culture for our users around the world. Music is something that everyone can appreciate and our KKBOX collaboration is a new and exciting way to promote Cpop to the world through real-time interactions and live conversations on our platform. 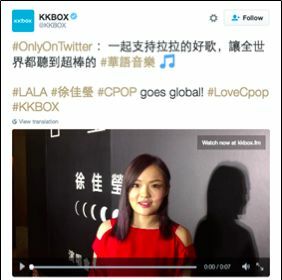 We're thrilled that KKBOX, one of Asia's top music streaming service platforms, will regularly create unique Twitter content with established and emerging Cpop artists, as well as during music concerts and award shows." 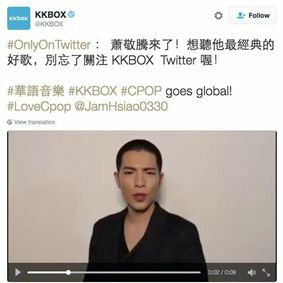 Twitter and Periscope will be the first social media platform to livecast behind-the-scenes action and song highlights of all Cpop concerts hosted by KKBOX in Taipei and Hong Kong this year. 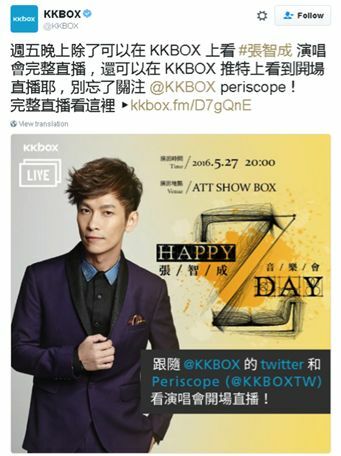 The first KKBOX music event to be featured on Twitter and Periscope will be Z-Chen (@zchen0508)'s concert starting from 8pm Taipei Time on Friday, May 27th. 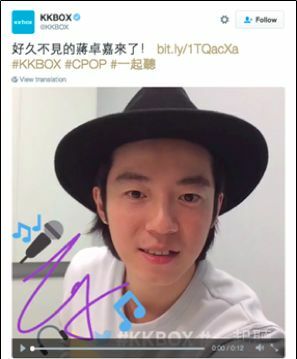 Follow @KKBOX on Twitter and @KKBOXTW on Periscope to enjoy the live video highlights of the upcoming KKBOX LIVE concerts with more to come. Lala Hsu - the Taiwanese singer-songwriter who won the Best New Artist award at the 2010 Golden Melody Awards and was crowned the champion for Taiwan's famous singing competition One Million Star. A-Lin - the aboriginal Taiwanese pop singer A-Lin got the title "A Born Diva". She has won numerous music awards and is extremely popular within the Mandarin-speaking world. Yoga Lin - the award-winning singer's debut album titled Mystery Guest in 2008 topped all the major musical and radio charts in Taiwan, Hong Kong, Singapore, Malaysia and China. 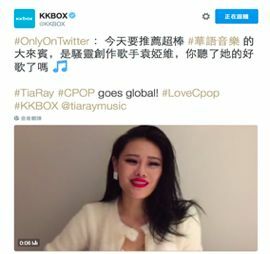 Tia Ray - the Cpop-R&B-Soul-Jazz singer-song-writer from Hunan Province of Mainland China was the winner The Best Stage Performance Award and Outstanding Singer Award at the 2015 Global Chinese Music Awards Ceremony. Finn Liu - the multiple music contest champion jazzy-Cpop singer from Heilongjiang Province of Mainland China was the "Best Newcomer" of the Guangzhou Music Chart Awards 2015. Jam Hsiao - Besides winning numerous music awards in the region, Jam was the winner of 2015 Ten Outstanding Young Persons in Taiwan. Derrick Hoh - the Singaporean idol singer gained nationwide recognition after emerging as the second runner up in Channel U's Project SuperStar in 2005. GJ - the music award-winning Shanghai-born Chinese Australian won "Best New Singer-song-writer" Music Radio China Top Music Award. He is well-recognised in Hong Kong and Taiwan. Twitter is an iconic service and global platform for self-expression and live conversation. Twitter has always been the best place to see what's happening now. Whether it's breaking news, entertainment, sports, or everyday topics, only Twitter lets you connect with people anywhere in the world with live conversation. Anything that happens, you see it first on Twitter. By developing a fundamentally new way for people to consume, create, distribute and discover content, Twitter enables any voice to echo around the world instantly and unfiltered. Twitter is available in more than 40 languages around the world. The service can be accessed at Twitter.com, on a variety of mobile devices and via SMS. For more information, visit about.twitter.com or follow @twitter.